Oskars Veide, Adam Taylor and Fiachra MacDermott. 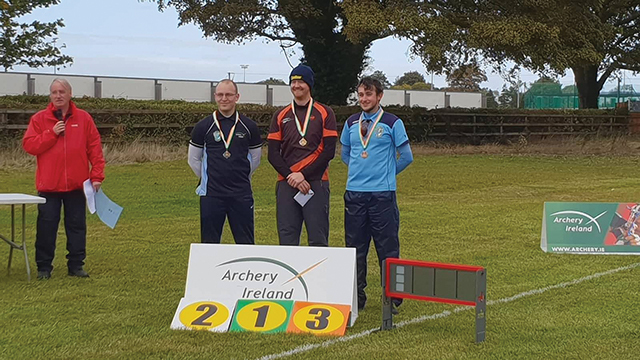 DCU Archery were represented at the All Ireland Series Outdoor competition during the summer, with two current members, and one DCU alumni taking the top three places on the podium. Current members Oskars Veide and Fiachra MacDermott placed second and third respectively while DCU Alumni Adam Taylor won the competition. MacDermott came third in the same competition twelve months previous and while he was happy with his finish, he admitted he would have liked to improve on last year’s performance. “I was happy enough with that finish, it was the same place I achieved last year but I’d wanted to improve rather than just maintain my level,” MacDermott told The College View. “I only lost one match to someone who really had set his goal on winning that competition, while my goals are more focused on next year and international competitions,” Macdermott said. MacDermott has set his goals high, as he aims to qualify for the Olympics in Tokyo in two years. If he is to achieve his target, he will have to qualify through tournaments throughout next year, with the World Championships and the European Games at the top of his agenda. “I still need to qualify for the European Games though which will hopefully happen around April,” MacDermott said. The Irish Student Archery Association (ISAA) runs five indoor Intervarsity league competitions and a National Student Indoor Championship every year. The first two intervarsities take place this year, with the first taking place in IT Carlow on November 10-11 before the second takes place in DCU on November 24. “We have some new talent coming in and our members are improving all the time,” MacDermott said.